If Only A Frosting-Covered Jeremy Piven Had Been Available, It Would Have Been A Perfect Evening. Last night we had a ten days-late celebration for Julesie’s birthday. We’ve all been on our various travels, so October 18th it had to be! Dinner was absolutely delicious (marinated flank steak–a new recipe I found online which is a total keeper–with roasted potatoes and my new favorite salad which has unseated my old favorite salad. Don’t worry, recipe is coming for that.). After dinner we played the “Clue DVD” game, which takes absolutely forever and has music that’s a little creepy and isn’t actually about a murder anymore but about a theft–hello touchy-feely 21st Century; the knife and the rope are GONE from this edition–and by the way I won but that’s not important. For dessert? Only one of the cutest cakes I’ve ever made. Coming off the last ugly one I made for a family member in February I was a bit worried that this one would look better in my head than in real life, but it turned out great. 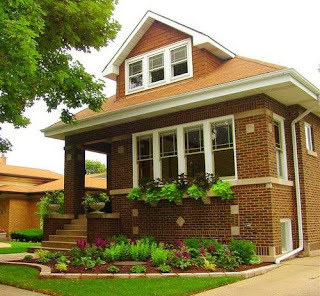 Background story: there is a certain style of bungalow house that is indigenous to the Chicago area. Our grandparents lived in one and I adored it. They even had that textured, velvet (Private joke note to Julesie: VELVEY!) flocked wallpaper in the hallway and breakfast nook. Anyway, people here loves them their bungalows. There’s an organization to protect them. There’s even a book about them. Here’s only one of the thousands of different bungalows in our area; isn’t it gorgeous? Anyway, the thirteen-year-old started calling Julesie’s future bungalow home a “funkalow” (you know, ’cause it’ll be funky. in a good way). And then it took off from there. She can store her “junkalow” in her “funkalow”, and she’ll marry his “unclelow”. Last night he even told her she could get “drunkalow”. So when I was coming up with this year’s cake design for our family’s traditional birthday Rainbow Cake, I found my house pan and thought a funkalow would be perfect. It turned out great, see? And it tasted just as good. That sounds like so much fun. Glad you had a good time. Please send me the link for the flank steak. I would that. Can’t wait for the salad recipe. Great job decorating! I’ll bet it tasted as good as it looks! Yummy fun with words and cake. Awesome! awww that’s too cute! and too sweet! Melis.. I am so impressed! Your penmanship with an icer is amazing. Now what would’ve taked the cake- making a a 3-D gingerbreadish like inspried funkalo! As for the ugly ice cream cake..have to admit I didn’t think it was all that bad. I love i-cake frosting! Yummo and SO CUTE! Happy belated Birthday Jules! Oh now that is just way too cute and cool 🙂 And umm just tell me that bungalow you showed isn’t in Park Ridge. It looks EXACTLY (down to the landscaping) like a friend of mine’s old house. Those houses are way fun… but definitely not as tasty as the cake you made looked! That rocks! Realtors here in this great corrupt metro area that we share tried to sell me one just like it in Berwyn and called it a “Georgian” because we didn’t want a bungalow. mmmmmmmm. Now I want a funkalow made from yellow cake dough! I love the term funkalow! Can I use it? We live in a bungalow, it’s small but sweet. I love the cake you made. LOVE IT! This so trumps the cake I made for my husband’s bday. The middle fell and the sides crumbled. Mmmm…but I’ll take a frosting-covered Adrian Grenier, please! Michelle: I have no clue where the actual bungalow photo was taken; I grabbed it off google images. Maybe Park Ridge though! Sarah: Go ahead and use it, what the heck! And oops on the hubby’s cake. But that just means your next cake will be fabulous. Trenches of Mommyhood: Hee hee, you can have him for your b-day; my sister’s man of choice would be JP… good thing, otherwise you two would have some fightin’ words!